There’s an adjective I use a lot lately in describing life in post-coup Bamako. That adjective is “normal.” Walking or driving through the city’s neighborhoods, and talking with its residents, one can be surprised by just how little seems amiss. And it’s only been three weeks since Mali’s political scene was completely upended and two decades of democratic rule interrupted. The sanctions imposed by Mali’s neighbors following the March coup d’état were lifted after less than a week (though there are those who contend the embargo was never really enacted to begin with). The military junta, the so-called CNRDRE, signed a preliminary agreement to hand over power to a constitutionally legitimate civilian leader, Dioncounda Traoré, who was sworn in on April 12 amid great pomp. And long before the political situation stabilized, the people of Bamako were going about their business. Six days after the coup, schools were back in session, government offices had reopened, and the markets looked as busy as usual. In many ways, “normal” accurately conveys what life in Bamako is like these days. The biggest change for most Bamakois’ daily routines has been power outages, rare and short-lived before the coup but daily 10-hour ordeals since. They are mostly an inconvenience for me, but pose severe problems for many Bamakois. Although we were initially told that these blackouts were a consequence of the ECOWAS embargo (which prevented fuel from coming into the country), they’ve continued in the week since the embargo was lifted. So it’s difficult to know what’s really causing them, although a power company spokesman claims they have nothing to do with recent political upheaval. A few days ago I visited the Cité Ministerielle on the north bank of the Niger River, a Libyan-financed Malian government office complex inaugurated in late 2011 (ironically, just as Gaddafi was being driven from power). It was my first time there since the coup. Driving through the gate, you can see multiple government ministries, with the usual number of vehicles and people moving about. From the outside, everything’s normal. Inside the buildings, however, it’s another story. Corridors are lined with shattered safes busted open by looters during the days after the coup when the complex was closed. 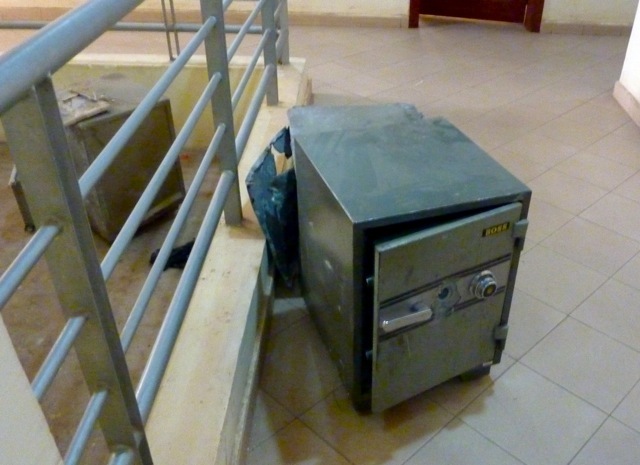 Office doors were broken open to get at the computers and office equipment inside; consequently, the ministry employees have nothing to work on. 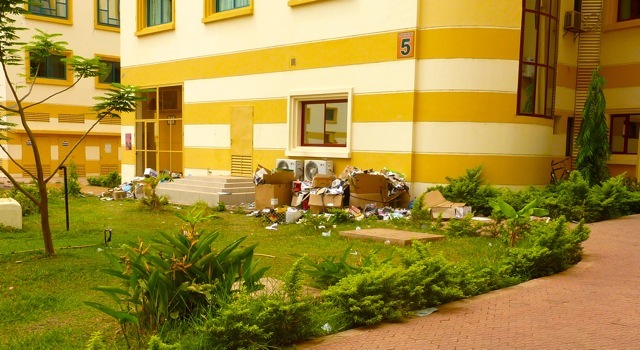 In the courtyards are great piles of trash, broken glass and splintered doors cleaned up since employees came back to work on March 27. It’s the same way in every office on every floor of every building in the complex, and there are over a dozen such buildings. The theft was systematic. Pillage on this scale could only have been carried out with the complicity, perhaps even the direct involvement, of elements of the Malian military (specifically the Garde Nationale) tasked with security for the complex. The same thing happened at Mali’s customs service headquarters, at the defense ministry, at the foreign affairs ministry and even at ORTM, which only continues to broadcast thanks to some of its mobile field units that have since been brought in to Bamako. Yet no investigation has been launched, let alone any guilty parties charged. If by chance culprits should be identified, they would likely benefit from the amnesty written into the accord between the junta and ECOWAS to restore civilian rule. And so the culture of impunity rolls on, as a new crop of political actors take advantage of their positions to enrich themselves at the expense of the state and the people they ostensibly came to serve. Those hailed for having ended a regime notorious for its corruption are beginning to mirror its most excessive practices. 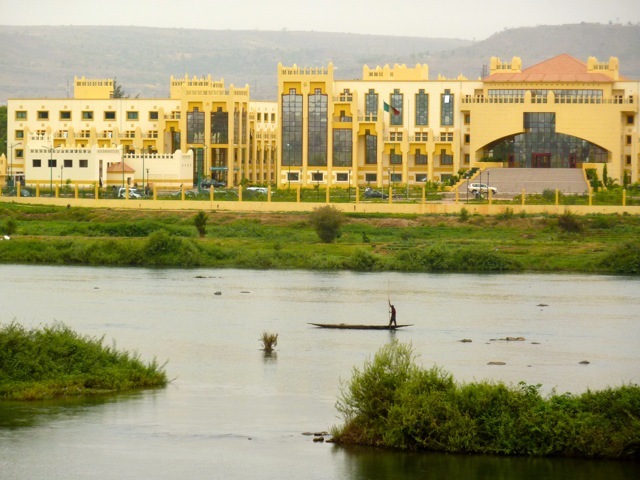 Already there are reports of junta members buying lavish houses in Bamako for themselves. This is, alas, what passes for “normal” around here. And in the words of my Canadian togoma Bruce Cockburn, the trouble with “normal” is, it always gets worse. This entry was posted in Uncategorized and tagged coup, looting. Bookmark the permalink. 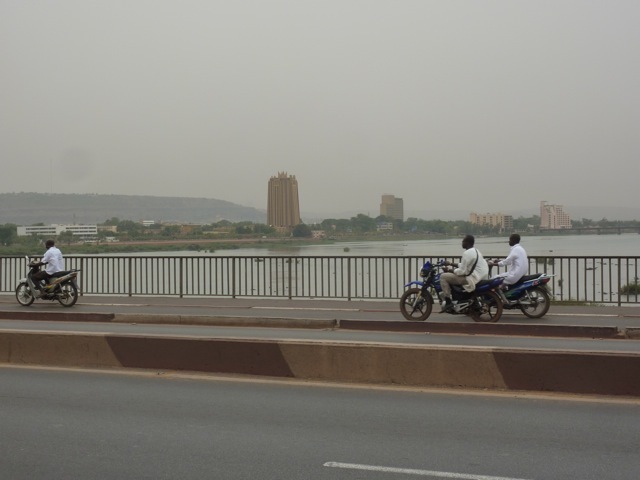 3 Responses to Is Bamako back to normal? Thanks again for posting your insightful and eloquent updates to what has been going on in Mali for the past few weeks. These posting have enticed me to go through all your past postings and I’ve truly enjoyed the all of yuor written work! In a day where the news will only give the most distilled and attention-grabbing headlines, you’ve managed to give rare nuance and analysis of Mali and life in West Africa. Again, my friends and co workers have been closely following your blog to get some well needed ground truth and we would like to thank you for your contributions! Thanks Scott, hope you and your colleagues appreciated my Bruce Cockburn reference. I will see if I can drop a few more into future posts. It is so great to hear your reporting from on the ground. I have been talking to my friends in Bamako and Sikasso who have been saying everything’s okay except for the electricity… but it seems like it will be a long time until anything approaching the former normalcy can happen.